Image courtesy J & M Home Fashions LLC. It’s your home’s dirty little secret: much of the grime in your house comes from outside, trekked in on shoes that don’t appear to be either muddy or dirty. Fortunately, a bit of smart planning can keep those messes from ever getting inside. We run down the top five ways to stop dirt at the door. 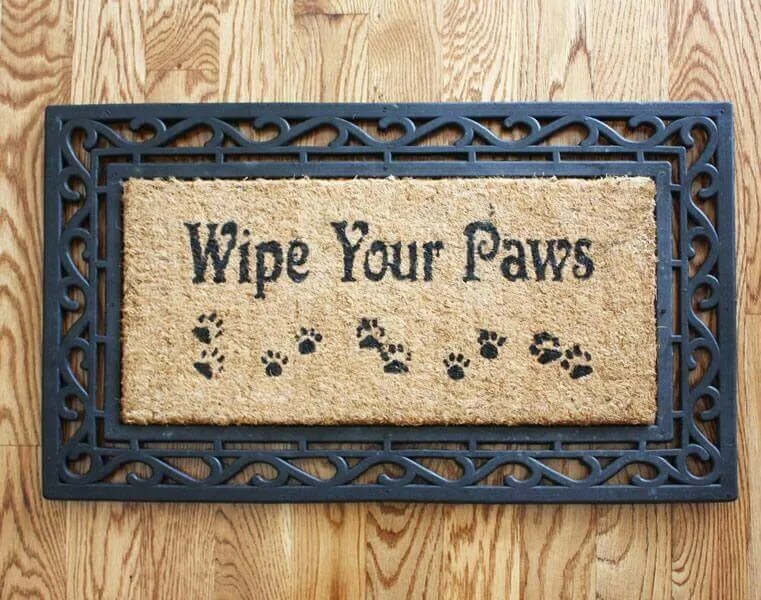 Ideally, your house should have doormats at every entrance and exit. The mats should be as wide as the door’s width, and long enough to cover the length of a typical stride – that way, people will walk over the mats as they cross the threshold, depositing dirt into them as they go. When selecting an outdoor mat, choose a durable material like rubber that can withstand the elements. If your area is prone to wet conditions, consider installing an outdoor wire rack to scrape off mud. Indoor mats come in a variety of materials; look for mats that can be easily cleaned with a vacuum cleaner or shaken clean outside. Clean your mats at least once a week. Let’s face it: dogs and cats are less than diligent about wiping off their paws before coming inside, which is why you need to be ready to clean up after them. Keep a rag or towel handy near the door to wipe off dirt, water and mud. Brush your pet’s coat regularly to keep hair from accumulating indoors. Most importantly, do these things outside – there’s no sense unleashing tumbleweed-sized hairballs in your home. Use indoor floor mats to catch dirt in high traffic areas like the fridge, the kitchen sink, the toilet and the bathtub. Be sure to choose non-slip mats to keep your dirt-catchers from becoming tripping hazards. Open doors and windows are an invitation for all kinds of particulate matter to occupy your home. Keep screens on windows and doors leading outside. Keep doors inside closed. You can also install door sweeps to keep dirt and debris from sneaking under entranceways. It can be tempting to hop outside in your loafers to grab the paper, but be sure to take off those shoes (or at least wipe off the soles) before you walk around the house. If your home doesn’t have a mud room, consider designating a garage, closet or shoe cubbie as the place to put outdoor footwear. If it was worn on your feet outside, it should stay outside.